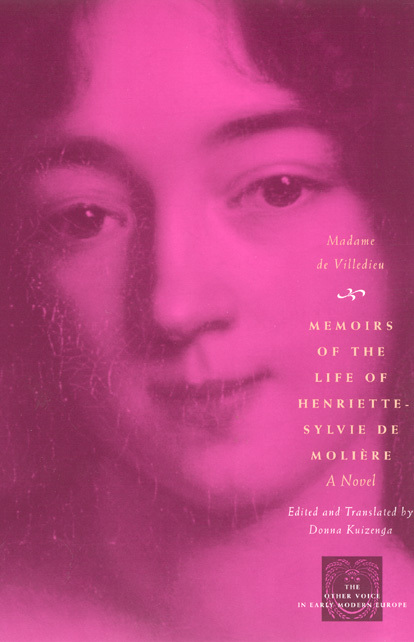 Memoirs of the Life of Henriette-Sylvie de Molière, a semi autobiographical novel, portrays an enterprising woman who writes the story of her life, a complex tale that runs counter to social expectations and novelistic conventions. A striking work, the story skillfully mixes real events from the author’s life with fictional adventures. At a time when few women published, Villedieu’s Memoirs is a significant achievement in creating a voice for the early modern woman writer. Produced while the French novel form was still in its infancy, it should be welcomed by any scholar of women’s writing or the early development of the novel. "The Memoirs constitute a ground-breaking, wonderfully hybrid text: picaresque novel? Fictional autobiography? Epistolary novel? All of the above, in fact. . . . This version of the Memoirs should be easily accessible to advanced undergraduates, and it would certainly be an important text to use in undergraduate or graduate seminars that discuss gender and/or the history of the novel. Ideally, the Memoirs would figure into an interdisciplinary course on early modern writers."